“Repo Man” is such a defiantly weird, punk rock movie that its unique nature has made it timeless. The film would be a cult hit if it came out today, nearly three decades after its release. Do you know how few ’80s films, a VERY dated era of moviemaking, one can say that about? “Repo Man,” aided by a gorgeous new restoration, feels both a perfect commentary on the Reagan era and a movie without a time period. With great performances, especially the timeless Harry Dean Stanton, and a script that’s smarter than you probably remember, “Repo Man” is a blast. 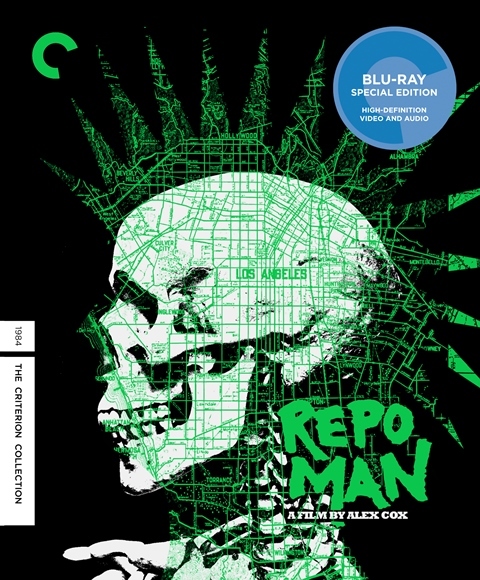 This is also one of those Criterion releases that includes more special features than their average edition. Commentary track, featurettes, deleted scenes, and even the entire TV version, which was edited and recut by Cox himself. When a little movie like “Repo Man” was first released in 1984, who could have imagined it would sit in a collection with some of the most important films of all time? And that Criterion would make the case that it would deserve it? A quintessential cult film of the 1980s, Alex Cox’s singular sci-fi comedy stars the always captivating Harry Dean Stanton as a weathered repo man in desolate downtown Los Angeles, and Emilio Estevez as the nihilistic middle-class punk he takes under his wing. The job becomes more than either of them bargained for when they get involved in reclaiming a mysterious-and otherworldly-Chevy Malibu with a hefty reward attached to it. Featuring the ultimate early-eighties L.A. punk soundtrack, this grungily hilarious odyssey is also a politically trenchant take on President Reagan’s domestic and foreign policies. “Repo Man” stars Emilio Estevez and Harry Dean Stanton. It was written and directed by Alex Cox. It was released on Criterion Blu-ray and DVD on April 16, 2013.